After being selected as the top graduating senior at a college university, Ms. Alvarado graduated first in her law school class. She further strengthened her legal research and writing skills by clerking on the Ninth Circuit Court of Appeals. She then joined a large, prestigious law firm and focused her practice on employment litigation, general litigation, and appeals. She next served as the Director of Legal Affairs and Litigation for a national public company. In 2004, she joined the Grasso Law Firm. She has represented a wide range of clients in general, commercial, employment, municipal, professional liability, and civil rights matters. She has handled all aspects of litigation, including arbitrations, discovery, dispositive motions, trial preparation, jury trials, and appeals. 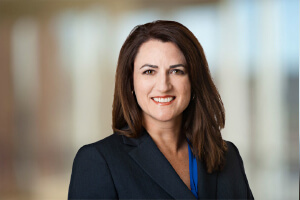 She has appeared before superior courts throughout the State of Arizona to argue dispositive motions in complex cases and has presented numerous oral arguments before both divisions of the Arizona Court of Appeals. Ms. Alvarado also has an extensive federal court practice in a variety of civil litigation and has handled numerous court appearances and oral arguments before the United States District Court for the District of Arizona and the Ninth Circuit Court of Appeals. Ms. Alvarado’s highly successful appellate practice has resulted in several published cases, including Arizona precedent on legal duties owed by charter schools and professional counselors, and federal precedent on First Amendment rights. Ms. Alvarado also has represented municipalities at administrative appeal hearings on personnel issues. Outside of her law practice, Ms. Alvarado keeps a busy schedule with her children’s activities in music, sports, and drama and doing volunteer work with her church. She has completed a half-marathon and several sprint triathlons.